The League of Friends relies on a group of about 80 volunteers to undertake the League’s activities in support of the hospital and its patients. 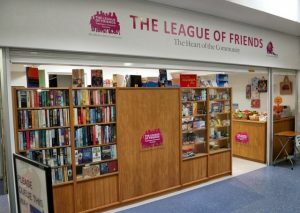 Apart from fund-raising and help with local events, volunteers are also responsible for manning the League of Friends shop. Volunteers therefore play an essential role in enabling the League to maintain its services within the hospital. Our recently refurbished shop is situated opposite the main waiting area and provides a very popular service to patients, staff, and visitors, being stocked with a wide variety of sandwiches, healthy option snacks, chocolate and drinks, toiletries, greetings cards, stationery and much more..The League depends on a team of volunteers to allow the shop to remain open every day of the week, including weekends. We are always looking for new volunteers to help out in our shop and if you are able to spare a couple of hours each week, on a regular basis or even just to provide occasional cover for while volunteers are on holiday, we would love to hear from you. Volunteering in our shop is a great way to meet new people, gain confidence and acquire new skills, as well as providing a vital service for patients and visitors. Three box collections are organised locally each year. We are always looking for new collectors, so if you are able to give a few hours of your time to help us, please contact us. We encourage volunteers to become members of the League, and in recognition of their contribution, the normal minimum membership subscription of £5 is waived. While many people do pay a subscription, the real value of volunteers to the League is the time they give. Volunteer Membership Secretary Required. – POST NOW FILLED The League requires a volunteer Membership Secretary to maintain our database of valued members. This will entail a couple of hours each week, working from our office/home, updating the League’s members records (both new and existing), dealing with subscriptions, producing monthly reports and accounts and mailing members for our AGM. With use of Access programme for managing the League’s database. Full training and support will be given for this exciting role, which maintains our links with members and generates income for enhancing the services and equipment at our much loved Hospital. If you feel you have suitable skills and would like to gain new experience and be part of a great team contact: info@friends-tmh.org.uk or call: 07713 445162 for further details about the role. Social Media Volunteer Required. The League is seeking a volunteer to help publicise our organisation within the community, on social media sites. This will entail a couple of hours each weeks, working from home, posting updates, news and interesting facts onto our Facebook page and Twitter account. This is a vital role which really helps the League keep in touch with the community and inform them of our work, up to date news and current funding campaigns. Full training and support will be given for this role, however experience of commercial social media sites would be an advantage. Volunteer Event Organiser Required. The League requires a volunteer to help organise and co-ordinate local events. Helping to publicise our work, raise funds and promote the services which are available at the hospital. Booking and managing existing events. Finding new events to attend within the borough. Arranging volunteers to help out at events (from existing volunteer list). Preparing and transporting items for the League’s stalls to and from events (Petrol expenses will be covered). Promoting the League’s aims and current projects. Full training and support will be given for this role, however a background in event organising would be helpful and the availability to work the odd Saturday or Sunday on an ad hoc basis. 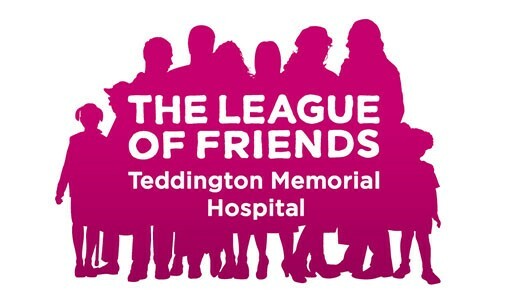 If you are interested in being part of a wonderful local charity, that raises funds to enhance the services and equipment at Teddington Memorial Hospital and would like further details about any of our volunteer roles, please contact: info@friends-tmh.org.uk or via our contact page.